Located at Prenn pass, on a road connecting HCMC and Dalat city, Prenn waterfall seems to retain pristine Highland mountains. Prenn name is reminiscent of a distant time in century XV - XVII, while mountain areas were the borders to wars of invasion or territorial defences. Prenn Cham origin meaning “land of invasion”, while many indigenous people such as Lat, Chil and the SRE called invaders “Prenn”. Visitors must cross a small stream with a petite bridge to the waterfall. This waterfall looks like a water-curtain pouring from 30 meters high down to a small valley which is surrounded by lots of flowers and pine hill. Noisy pouring waters, chirping birds in forests, the sound of the wind charging each branches of pine trees create vibrant sounds like a joyous spring to welcome travelers’ footsteps. Beneath the waterfall, blooming wild petals make the landscape become more attractive. Visitors can walk along the path to the zoo, orchid gardens, or go for a leisurely stroll to see flowers blooming, petite huts on the treetops, or try walking on suspension bridges. In another aspect, the solar rock garden is filled with impromptu arrangement creating a pleasant surprise. 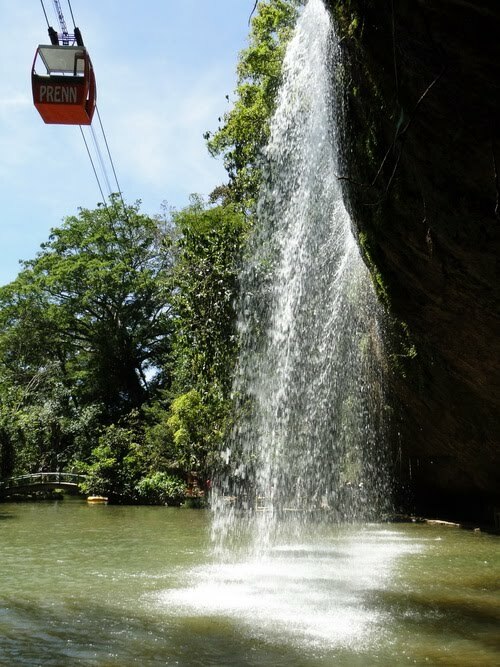 Especially with the cable cars system, visitors can cross the waterfall in the sense of adventure, almost walking into a fairy realm. In 1998, at Prenn waterfall, there was a small zoo including bears, elephants, alligators, etc. this site has been equipped with rowing-boats and suspension bridges, souvenir shops, and a restaurants serving foods as tourists’ desires. 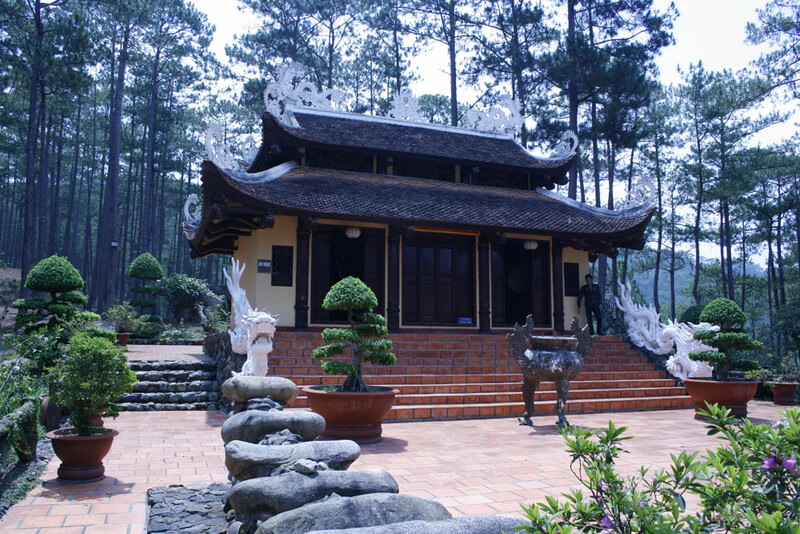 Since Tet 2013, a complex of Au Lac Temples, including the Upper temple, the Middle and the Lower temple, is located on the hillside for both eco-tourism and for remembering the ancestors. It was believed that Lac Long Quan and Au Co were Father and Mother of Vietnamese people. 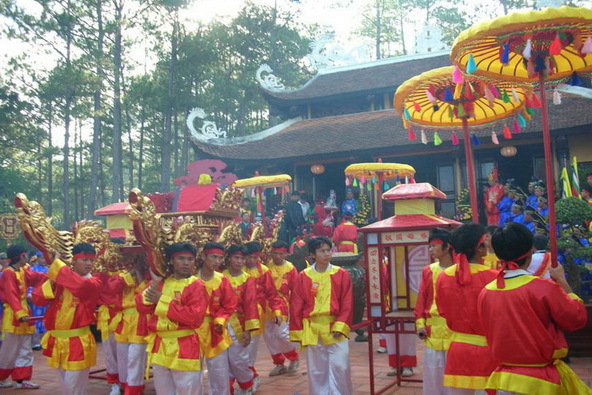 Therefore, the temples were designed like the original one in Phu Tho. There are also cable cars on the waterfall top and rowing boats at foot of the falls. Moreover, there is a special dish called the snake-head fish soups in Prenn waterfall. This soup served with mustards (a traditional dish of Japan) gives visitors an unforgettable feeling. 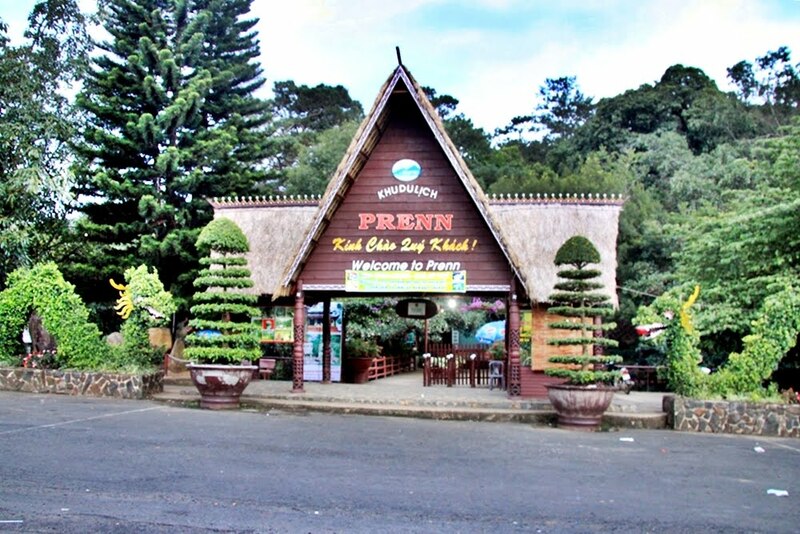 Being the gateway to Dalat city, next to the main national road 20th, Prenn Waterfall is situated right at the foot of Prenn Pass, 10 kilometers from the center of Dalat city, Lam Dong province. This is one of the most beautiful charming waterfalls in the Southern Highlands. It was said that Prenn waterfall is derived from the K'Ho-called Prenh, which means thorn apples and then people were more likely to say Prenn. In fact, in the upstream of the falls, there are a lot of thorn apples along the banks of the streams growing wild. This fruit is are small and round like eggplants but with green skin and white spots, and it turns yellow when ripping. In the old days ethnic people ate thorn apples which taste bitter. However, the name of Prenn waterfall was derived from the Chams language which means “land of invasion”, according to ethnographies. The name comes from the war which was quite persistent among minority tribes living on this land against “West Expansion” of the Chams in Panduranga (Ninh Thuan) in the 17th century, so the local people called this majestic waterfall “Prenn”. 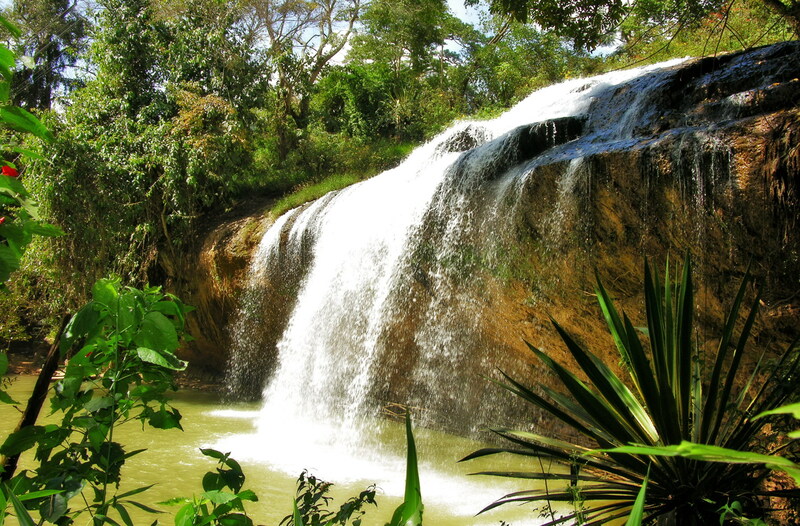 In 2000, Prenn Waterfall has been recognized as a cultural historical heritage by the Ministry of culture and information. In recent years, the waterfall is restoring and welcome visitors to Dalat by many operators such as impressive cable cars, rowing-boats, suspension bridges, ect. Especially in 2002, the management unit invested in building An Lac temples on the side hill looking down the falls. From the waterfall, visitors can climb to the temples through steps or they can hire a jeep to the lower temple then they can go on foot to the middle temple and to the upper temple at last. Statues of Lac Long Quan and Au Co are placed in front of the upper temple. 100 pieces of round rocks taken from Ninh Thuan symbolize for 100 eggs and all of them are right beside the statues of Lac Long Quan- Au Co. It is said that Prenn Waterfall is the first destination for tourists on the way to explore the wilderness of Dalat city. Not only going on an excursion with clouds and the wind, but also experiencing sense of adventure by sitting on a cable car to pass the waterfall, visitors take part in local people’s unique games such as: shooting with crossbows, shooting arrows, drinking pipe-wines, etc. 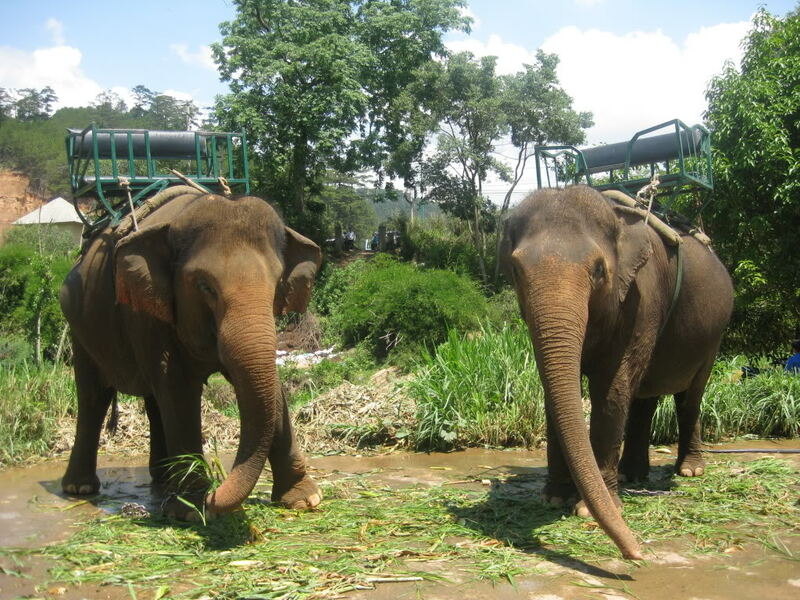 besides, visitors can ride elephants, or ostriches in order that they would have exclusive pictures of Dalat city to show off to their friends.